Additive synthesis is finally coming of age, with synths such as Harmor easily living up to the potential for massive sonic firepower. Rich, evocative sound; good resynthesis algorithm; image synthesis is a blast; powerful custom filters; brilliant multistage envelopes; presets are terrific! Slightly intimidating at first; no Mac version. Harmor's waveforms are created using additive technology with up to 520 partials. The FX tab is active here, with distortion, chorus, reverb, delay and compression all on tap. The image import function enables you to paint pictures with sound… or is it the other way round? 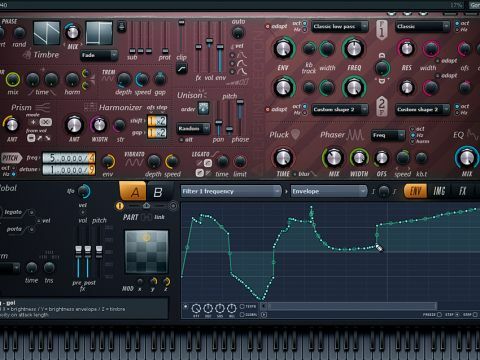 Image-Line seems intent on single-handedly flooding the market with variations on additive synthesis. And who are we to complain? We're always carrying on about how we'd like tosee developers exploring new territory, and while additive synthesis ain't exactly on the bleeding edge, it's a darned sight more futuristic than yet another analogue retread. Image-Line has released a long line of additive instruments, each with varying capabilities. Some have been dedicated to resynthesis; others to percussion. The company even gave us a taste of the new offering in the form ofits stripped-down, proof-of-concept sibling, Harmless. If that one knocked you out, then this will blow you away. In many ways, Harmor is a return to form for Image-Line. First, the bad news: Harmor is Windows-only. This is going to be disappointing for any Mac users who continue reading this review, because Harmor really is a blinder of a synth. With its charcoal and plum shadings, its look is also unmistakably Image-Line. Format-wise, it's aVSTi and FL Studio plug-in. The developer positions Harmor as an 'additive/subtractive' synthesiser, but there's no doubt that the emphasis is on the former. Even typically subtractive elements like the filter are achieved via additive technology. Yes, some things will be familiar. There are, for instance, selectable oscillator waveforms - a pair per 'Timbre' - that can be mixed as you see fit. However, those waveforms are generated by additive means, and displayed in the Env window. You can draw directly in this window and import single-cycle waves, audio files or images to create your own waveforms. Up to 520 partials may be present in any waveform. It should be noted that each patch can consist of two complete and individual patches that are stacked or dynamically mixed. Harmor includes many ways to tweak your waveform, and some of them might be unfamiliar. Examples of these new paradigms include the Prism and Harmonizer sections. The former simply shifts the positions of the partials, making them inharmonic; while the latter replicates and transposes harmonics. Both have the effect of thickening the sound in some way, or creating dissonant timbres. Another thickener comes in the form of a sub-harmonic generator, which is used to add bass and depth. Clipping is also provided. Harmor sports a dual-filter configuration thatincludes allof the normal goodies. You canchoose from the usual filter mode suspects, with the addition ofCustom Shapes; these are defined inthe ENV(elope) display and are drawn in just like the additive waves. This is seriously powerful stuff! Since the perception of an additive tone relies somuch on the fundamental, there is a Prot(ection) slider in the Timbre section that ensures the lowest frequencies squeak through unharmed. The filters are joined by Phaser and Pluck sections. The latter deserves special mention: it functions as a fast-decay low-pass filter envelope to simulate plucked strings. Setting short times garners sounds similar to synth legend Don Buchla's low-pass gate, making it easy to get your bongo on, if you are so inclined. Harmor's envelopes play a significant role in its ability to produce sounds of stunning complexity. The envelopes and LFOs share the same display and features. These are the massive multistage envelopes also seen on Image-Line's Sytrus, and they can be applied to virtually any parameter that matters. They are powerful enough that they double as sequencer and arpeggiator as well as a standard envelope. As you'd expect, stages can be locked to project tempo. Of special note is Harmor's ability to analyse audio and create an envelope based onthat analysis. This seems an obvious task for an additive resynthesiser, and we're glad to see it taking its place here. Well, not really. We simply haven't got the space to describe every parameter in detail. However, we should point out that Harmor also has a host of more traditional features on offer. There are loads of effects, for a start, including reverb, delay, distortion, chorus and compression. Effects can be re-ordered on the Adv(anced) page. There is an EQ and a nifty visual feedback panel that can help get an idea of what's going on under the hood, too. There's also an awesome Strum function that does what its name suggests but turns out to be excellent for wind-chimes and other clangorous patches as well. So, how does Harmor sound? In a word, magnificent. Image-Line has created a synth that will leave no doubt in the minds of software naysayers. And talk about an all-rounder! The instruments excels at crystalline digital timbres, but is utterly convincing as an analogue synth, too. Its resynthesis engine is among the best we've encountered (witness the piano patches) and the image conversion feature makes for some instantly gratifying weirdness. The idea of analysing a photograph or other image and converting it into sound is hardly new. There can be few among us who haven't heard the story of how IDM hero Richard D James converted a pic of his own mug into a spooky, spectral sonogram for the classic Aphex Twin track Windowpane. Image-Line itself has trodden this path before, and with good results. Harmor has a dedicated Image window. You can import loads of file types, including JPEG, PNG and BMP (not TIFFs, though). Once imported, there are a number of options. You can invert an image, flip it, or even edit it in Paint from within the instrument. As with audio files, the image file is scanned from left-to-right when you play and hold a note. You can control the speed, mix, loop and position in time. The Frequency Scale parameter enables you to determine how much pixel brightness affects the pitch. The effect is quite satisfying. Slow speeds can produce grand, sweeping timbres, while faster speeds can generate gurgling organic sounds or unusual rhythmic devices, depending on the image. A dab hand at Paint could easily use this to take total control. We had a great time using a Wacom tablet to draw freehand (even if our cursor didn't quite match the pen position). Overall, there is a richness in tone here that, frankly, took us by surprise. It must have inspired the preset designers, too, because Harmor is rammed full of some of the best plug‑in presets we've heard. Of course, an instrument of this complexity begs one to dig into the parameters and do one's own thing. Sound designers and all other preset-shunners will find a lifetime's worth ofinspiration, even if it does take a bit of head-scratching to figure out at first. And that's just it. Image-Line has taken a different approach to the additive hybrid. Normally, developers cludge subtractive elements onto an additive synth to make it easier to use. Not so, Image-Line, which means Harmor can be a bit intimidating on first blush. However, it quickly reveals its secrets to those who persevere. We urge potential customers not to be put off by its unfamiliar look and terminology - you'll be missing out if you do. Harmor is an instrument that deserves to stand out from the crowd. Now, where's that Mac version?